This is just an amazingly well shot TV show. Even the camera panning across a room feels like an adventure in itself in the way the viewer seems to be drawn in by the camera travels. The camera work is so good that the viewer often feels like they are moving with it. It is almost as if the world these characters occupy is actually surrounding the viewer. This sensation is just the impression I got from the first few seconds of this episode as we see Lady Pole awaking from slumber. That is how brilliant well crafted TV can be. Even the first few seconds, despite nothing much happening on-screen can draw you in and submerge you completely in a fictional world. This show is fantastic escapism from the mundanity of the normal world. The streets and environments have as much character as the people in the story lines. It makes the world that bit more immersive. The directing in this episode set it apart from the rest every shot looked incredibly cinematic as if the director never allowed an average piece of cinematography. There were some interesting character moments around the camp fire in this episode. The interactions between Jonathan Strange and the troops was really nice to see. That scene also added something to the world these characters inhabit, the lighting on the forest around them was very clever and the sounds of insects made it seem almost like the forest itself was speaking or breathing. The execution of this scene was reminiscent of Fanghorn Forest in Lord of The Rings: The Two Towers. I really liked the idea of Strange being involved in the war. The talk of magic and how it works was fascinating, so little is known about it for the viewer that any talk of it is gripping, leaving the viewer with an appetite for more information. Strange creating a road to make the army’s travel easier was very well done. It looked great and it gave the magic a practical use in the war. I like that these characters are very three dimensional, they aren’t perfect, they have their flaws. In fact, Mr Norrell and Childermass could be considered morally ambiguous. The tapestry Lady Pole created was a cool idea. But why did Childermass destroy it? 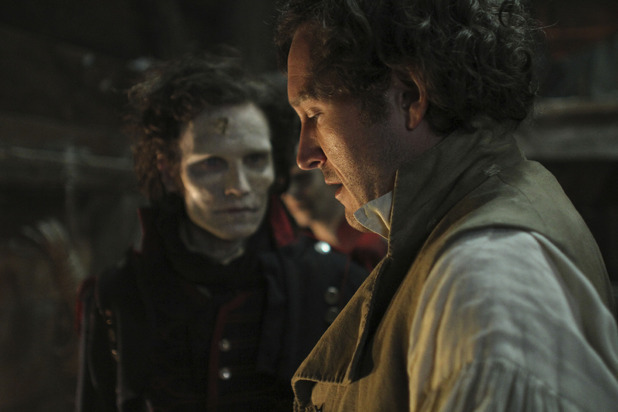 What motive do Mr Norrell and Childermass have to be sneaking around like this? We were treat to a sequence in which Strange attempted to do magic in the middle of a battle. The moment a cannonball ripped through trees and took out Strange’s assistant was very dramatic. There was a very real consequence to the violence in this episode. The moment Strange conjured the mist to conceal the position of the Englishmen was a really great one. It made the character seem very capable in a terrifying scenario when previously he seemed a bit bumbling. Marc Warren’s mystical character is creepy, enigmatic and really quite interesting. There was sine very detailed and impactful acting from Bertie Carvel when in one scene his hand can be seen shaking ever so slightly as he inspects a scrap of paper. He is clearly haunted by the things he has seen on the frontline. Strange performing the magic of the Raven King was very dark, it was shot in a very peculiar way. The camera angles made it feel like everything was being turned upside down. The corpses rising from the grave and speaking a strange language was really creepy, reminiscent of the Evil Dead films. There was even a jump scare in there. It was obvious that the jump was coming but I jumped anyway which was quite funny. This myriad of reactions to various different thematic instances is what you want from a TV series like this. It really is an adventure. Despite the aesthetics of the series seeming grounded in history the magic, when it occurs never feels out-of-place or gratuitous. 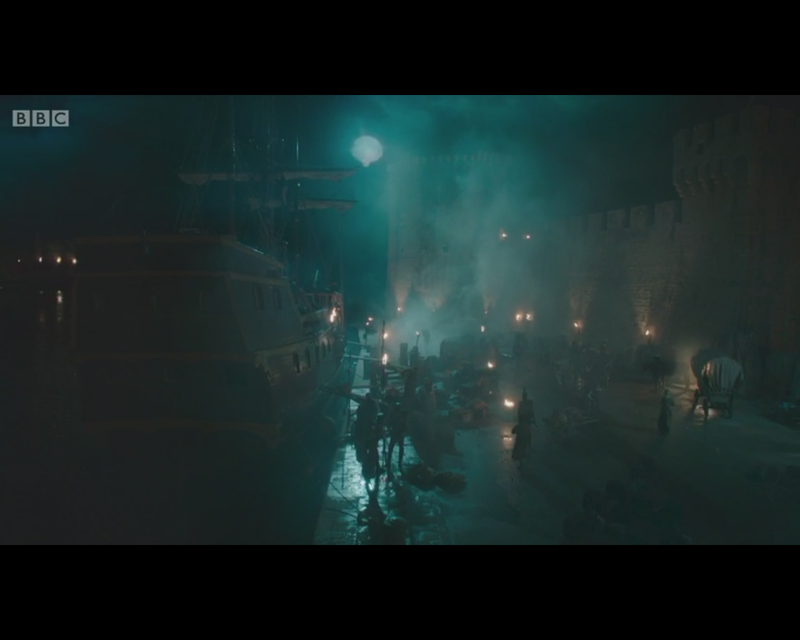 The final scene was very dramatic with Childermass being shot instead of the intended; Mr Norrell. Will Childermass survive this incident? This has huge implications for the story going forward. This seven part series is already flying by, unfortunately I suspect the series finale will be here before we know it. It is such an enjoyable world to hang out in that I would love to have more than seven episodes, but you can’t have everything I suppose. I am interested to know how closely the show sticks to the source material. Is the TV show close to the novel it is based upon? If you know tell me in the comments section below. BBCBertie CarvalChildermassDramaEddie MarsanFantasyhistoricalIs Childermass dead?Jonathan StrangeJonathan Strange and Mr Norrelljonathan strange and mr norrell episode 3jonathan strange and mr norrell episode 3 reviewMr NorrellThe Raven KingTVTV Reviewwill Childermass survive?